Home Research Faculty Mavis Agbandje-McKenna, Ph.D.
Research: Structural studies of ssDNA viruses, Parvoviridae, Geminiviridae, microviridae, and circoviridae. Professor Mavis Agbandje-McKenna received her Ph.D. in biophysics at the University of London in 1989 under the direction of Prof. Stephen Neidle for work on the biophysical characterization of a novel group of DNA-intercalating anthraquinone anti-tumor agents. She then joined Prof. Michael Rossmann’s laboratory at Purdue University, Indiana, where she carried out research on structure-to-function correlation for the ssDNA Parvoviridae. In 1995, she joined the Department of Biological Sciences at the University of Warwick, England, UK, as an independent research fellow, where her research expanded to studies of the ssDNA Circoviridae and Geminiviridae. 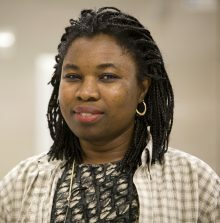 Dr. Agbandje-McKenna joined the Faculty at the University of Florida in 1999. Using structural biology tools, namely X-ray crystallography and cryo-electron microscopy, combined with other biophysical approaches, biochemistry, and molecular biology, we study members of the Geminiviridae, Circoviridae, and Parvoviridae ssDNA virus families. 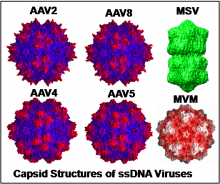 The aim is to elucidate the roles of viral capsid and capsid protein structures in the dynamic array of biological processes occurring in the viral life cycle, from the initial stages of host infection to the delivery of genetic material into host cells and encapsidation of genomic DNA in viral progeny. We are also interested in understanding viral capsid adaptations that govern interactions with host immune machineries, especially mechanisms of host immune surveillance evasion and antibody neutralization. The ultimate goal is to develop disease treatments, in the form of capsid assembly disrupters, viral vaccines, foreign antigen delivery vehicles, and gene therapy vectors.